On November 11, 2013, the International Court of Justice at The Hague rendered a decision on the longstanding dispute between Thailand and Cambodia regarding the Preah Vihear temple, ruling that the temple and much of the surrounding grounds belonged to Cambodia. This brings to at least a temporary close a conflict that has lasted decades and resulted in many deaths. 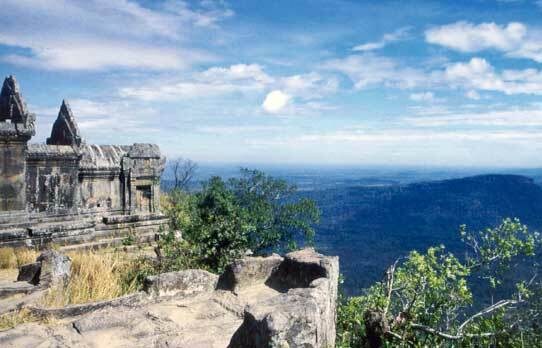 Named a UNESCO World Heritage Site in 2008, Preah Vihear (“sacred shrine” in Sanskrit) is situated at the top of Phra Wihan Hill in the Phanom Dong Rak Mountains, with a spectacular view overlooking the nearby plains of both Cambodia and Thailand. The complex was probably begun in the late ninth or early tenth century, and was dedicated to the Hindu god Shiva. Most of the construction took place during the reigns of the Khmer kings Suryavarman I (1002-50) and Suryavarman II (1113-50). In later centuries when Hinduism became less popular in that area, the temple was adapted to Buddhism. The complex is composed of a series of sanctuaries, along with courtyards and libraries, linked by a system of pavements and staircases. Approaching the main sanctuary, one must pass by five gopuras, or entrance towers. One features a grand depiction of the Churning of the Ocean of Milk (a story also depicted in a huge, famous bas-relief at Angkor Wat). 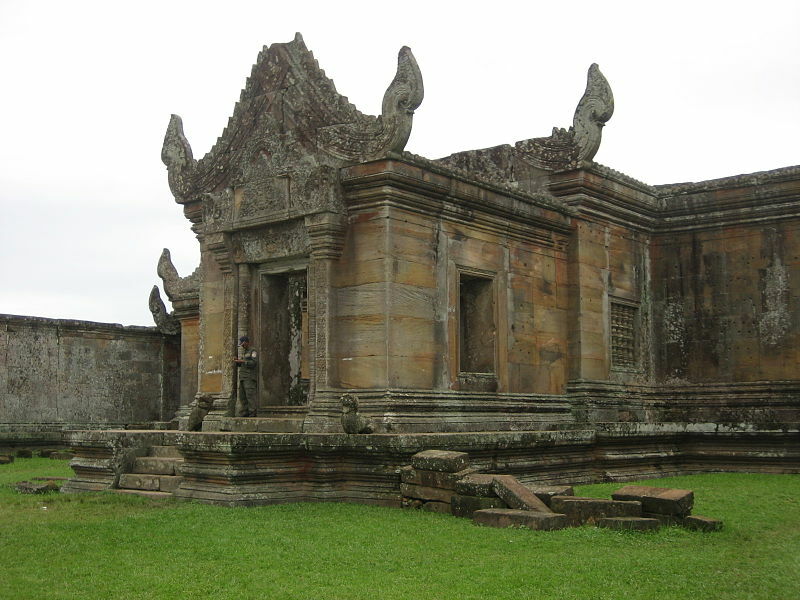 Like so many ancient Khmer temples, Preah Vihear was meant to represent Mount Meru, the home of the gods. After being more or less forgotten for centuries, Preah Vihear became a point of controversy at the onset of the twentieth century. When Thailand and Cambodia worked out their border in 1904, the Phanon Dong Rak mountain range was to serve as a demarcation line, placing most of the Preah Vihear complex in Thailand. 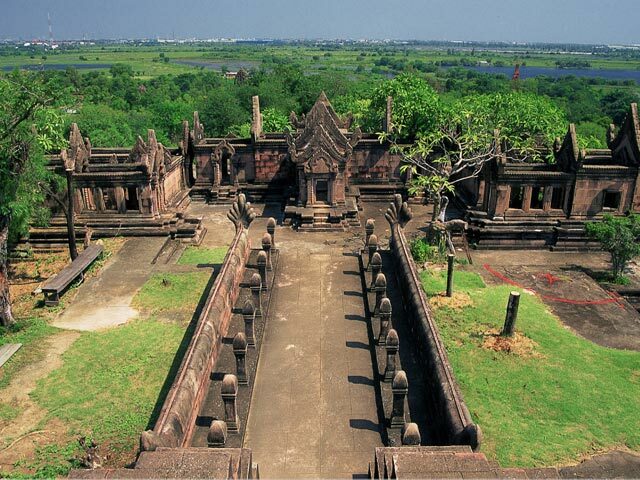 But when French officers drew up a map of the border, for reasons unknown the temple was placed on the Cambodian side. Thai forces occupied the temple after French troops withdrew from Cambodia in 1954. Cambodia protested, taking their claim to the International Court of Justice, which in 1962 used that French map from decades before – which, they said, Thailand had not protested in the ensuing decades – to rule that the Preah Vihear temple complex was part of Cambodia. Thailand’s government reacted angrily, and mass protests ensued in the country. Eventually they backed down and allowed Cambodia to take possession of the site officially. When Cambodia’s civil war began in 1970, the opposition to the Khmer Rouge used Preah Vihear as a stronghold, only giving it up in 1975 (the last part of Cambodia to fall). For many years thereafter access to the temple was irregular as sporadic fighting continued. Fairly substantial military clashes between Thai and Cambodian forces occurred in 2008 and 2011, killing dozens. Gunfire from both sides did some damage to the Preah Vihear structures, and thousands of nearby villagers were forced to flee their homes. Each side blamed the other for the damage. In 2011 the International Court of Justice ordered both sides to remove their troops as further discussions ensued about where the border would fall. Finally, on November 11, 2013, the ICJ ruled that the temple and the promontory around it belonged to Cambodia, and that Thai security forces should leave. The decision was of course welcomed in Cambodia. “This is the victory of all the nation and the reward to the political maturity of the current Royal government of Cambodia,” Information Minister Khieu Kanharith posted to Facebook. With the country’s recent history of genocide and civil war, Cambodia’s Khmer civilization of centuries ago, represented in complexes like Preah Vihear, is an important rallying point for the nation. While both sides have officially accepted the ICJ decision, there is still fear among many who live nearby that hostilities, or even war, between the two countries, could break out. According to the Thai newspaper The Nation, one Thai nationalist group, the Thai Patriotic Network, has said it rejects any ICJ judgment and has already petitioned the court to have the case thrown out. Even so, nearby Thai villagers who had fled their homes because of the ongoing fighting have started to return. Both countries have expressed an interest in working together to develop Preah Vihear further as a tourist destination. 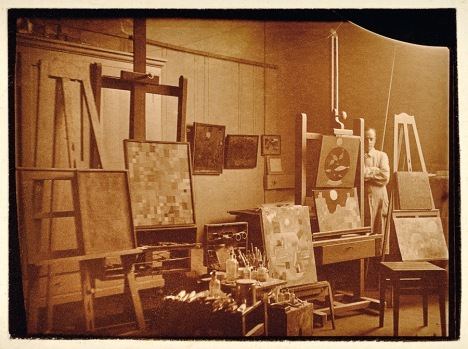 Paul Klee in his Bauhaus studio, Weimar. Photographed by Felix Klee, 1925. Place: In my computer-music-storage room, now a mess of reference books and broken down computers and very narrow walking areas. Eating: Nothing yet today. But I may well eat something in the next few weeks. Reading: In theory I’m continuing with Roger Lipsey’s The Spiritual in Twentieth-Century Art, but that has largely ground to a halt this past week, for reasons detailed below. For a little “lighter” reading in the evenings, I’m slowly working on the noir crime thriller Bangkok 8 by John Burdett. Watching: As an attractive way to conclude my days, I have been watching, one episode per night, the television series Going My Home (sometimes translated as Going Home) by one of my favorite directors (whom I have mentioned several times before in this blog), Hirokazu Koreeda. My viewing of the series concluded earlier this week, and I’m somewhat saddened to see it come to an end. I recently read that the ratings for Going My Home weren’t great when it originally aired on Japanese television a couple of years ago. This doesn’t surprise me much, I have to admit. The very things that I loved about it – the slow, cinematic pace, the quietness and calmness of the tone, the loose approach to narrative – might well make it dull for many people. Personally, if television in general were more like Going My Home, I’d probably watch more. I would very much like to live in the universe of that series – where all the people are attractive and interesting and gently quirky, where much time is spent cooking up visually beautiful meals, where a small group of devotees go on annual searches for Kuna (and believe in the existence of these tiny elfin creatures that live in the forest and wear pointed red hats), and where all the day’s activities are accompanied by sweet acoustic guitar music. Listening: I’ve been doing a lot of music listening this week, but not music of my choosing. Practically every available waking moment – most days starting at 6:00 a.m. and concluding at 8:00 p.m. – has been spent preparing the printed program for the annual Nevada Chamber Music Festival. The Festival isn’t until December, but all the contents of the fifty-or-so page program book have to be ready for laying out for printing by the end of this coming week. This would include the program notes for each of the forty or so works to be played at the twelve Festival performances. So, with the exceptions of a few pieces we have presented in past years, I’ve been listening to all the music that will be played at the Festival, researching it, and writing brief notes about it. While it has been mildly exhausting, the process hasn’t been so bad this year, as compared to some very stressful past years. And I have been fortunate enough to make the acquaintance of some wonderful music I’ve never run across before, like Karol Szymanowski’s violin-and-piano suite Myths, a masterpiece of tone color, and Gabriel Fauré’s really lovely Piano Trio, which he wrote at the age of 78. Pondering: How I kind of like finding the wet fallen leaves of autumn stuck to the bottoms of my shoes after my early morning walk each day. Blogging: What blogging is that? This is my first entry in many days, but I hope it signals a return once the Chamber Music Festival writing project is done. Anticipating: In two weeks I’ll be heading to San Francisco for some needed art museum time. I’m especially looking forward to In Grand Style: Celebrations in Korean Art During the Joseon Dynasty at the Asian Art Museum and the retrospective Anders Zorn: Sweden’s Master Painter at the Legion of Honor. Gratuitous Image of the Week: I recently came across this at the excellent A Man With Tea website. 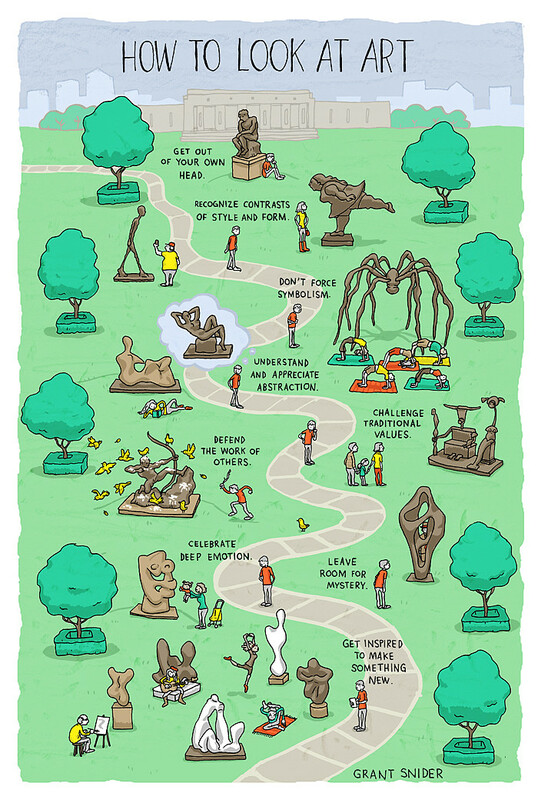 While, like him, I don’t think it applies to all art, it’s still a pretty useful guide, and a reminder to maintain a sense of openness and, yes, fun when encountering art. What Are You Gentlemen Doing In My Trousers?